The summer before my senior year of high school, Lawrence O. Graham became my best friend. We had never met, and I didn’t even know what he looked like; but during the months of July and August we went everywhere together…sort of. I was in love with his book, the Ten-Point Plan for College Acceptance. I read it backwards and forwards, literally, and before summer was out, I knew Graham’s strategies for admission inside and out; but I also felt like I knew Graham himself. After I was accepted into the college of my choice — thanks in no small part to Graham’s advice — I began reading his book on college success, Conquering College Life: How to Be a Winner at College. It wasn’t until I was halfway through this book that my mom saw him interviewed on a television talk show. The interview revealed that Graham was young, a recent graduate of Princeton University, and Black; and The Ten-Point Plan for College Acceptance, the book that had been my personal handbook during the college application process, was published when the author was only 19 years old! That was all my high school heart needed to know. I was in love, in that bff (best friends forever) sort of way. Graham was like me, a bookish, intellectually precocious Black kid who was very serious about college admissions; and on top of all that, Graham was sorta kinda living my dream — while I aspired to be a writer, he already was. Eventually one publisher suggested he get an agent to help sell his book. Grateful for the advice, Graham flipped the telephone directory from `P’ for publishers to `L’ for literary agents, and opened his second roll of dimes. He had reached “Zeckendorf, Susan,” the next to last name on the list, before getting an appointment, which eventually led to the book’s publication. The Ten Point Plan sold 20,000 copies and earned him guest appearances on the Phil Donahue Show as well as on the Today Show. In the 25 years since I first encountered The Ten-Point Plan, I have followed Graham’s career with fascinated interest. Lawrence Otis Graham’s career exemplifies the path of the classic polymath (homo universalis, uomo universale), a true renaissance man who is both knowledgeable and highly skilled in many areas. A graduate of Harvard Law School, Graham is employed with Smith, McDaniel & Donahue, a law firm specializing in environmental issues, and he is also president of Progressive Management Associates, a diversity consulting firm. 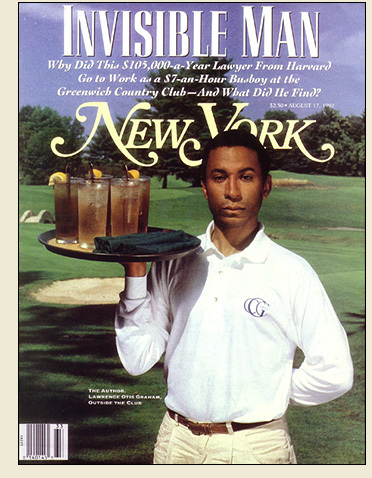 Despite these professional accomplishments, though, it was his groundbreaking and controversial 1992 New York Magazine article on Graham’s experience working undercover as a busboy at the exclusive Greenwich Country Club that launched him on the path toward becoming one of the nation’s most highly regarded commentators on race and integration in the United States. In his article on the Greenwich Country Club, titled “Invisible Man” Graham revealed an atmosphere deeply entrenched in what has been called genteel racism. Graham’s damning exposé generated a mountain of controversy and a flood of letters, and acquainted a broad cross-section of American readers with the insight and erudition of this previously little-known provocateur. In the 15 years since the New York Magazine article Lawrence Graham has used his skills of analysis and critique to examine the influence of race and the function of the color line on a variety of institutions, constituencies, and individuals ranging from the U.S. Black elite (in Our Kind of People), to national politics (in The Senator and the Socialite), to the American workplace (in Proversity), to himself (in Member of the Club). A contributing editor for Reader’s Digest who has written for New York Magazine, The NY Times, Essence, and U.S. News & World Report, Graham has appeared on Today, The Phil Donahue Show, The Oprah Winfrey Show, and WNBC-TV, CNBC, and CNN. Graham’s unique perspectives may soon make their way to the big screen. Warner Brothers is currently developing “Invisible Man,” his New York Magazine piece on the Greenwich Country Club, into a film starring Oscar-winning actor Denzel Washington. Graham has been roundly criticized, most notably by author Shirlee Taylor Haizlip, for viewing the struggles and interests of working-class and poor Black people through the lens of elitism. Haizlip opines that when Graham engages the issues and experiences of his working class brethren, “a shared sense of humanity never comes through.” However flawed Graham’s analyses of the lives of working-class and for African Americans may be, his explorations of the origins, customs, mores, and challenges of the African American upper classes, are perceptive and bold, unflinching and candid. I would like to finish this profile with a brief passage from Graham’s Our Kind of People, his study of the Black elite in the U.S. This passage, excerpted from a post in the blog Far Outliers is an example of the author at his best, exploring the movements, attitudes, history, and future of the Black elite. Thanks for adding Black on Campus to your webpage. Afronary.Net, sounds like a much-needed resource, and I will encourage the Black bloggers I know to check it out! Thanks for putting your site together. What a cool person. The world needs more people like Graham.